Anne Michaud, Hunter’s Trap. Sad Ghost Press, 2014. Pp. 256. ISBN 978-1-501008-82-5. 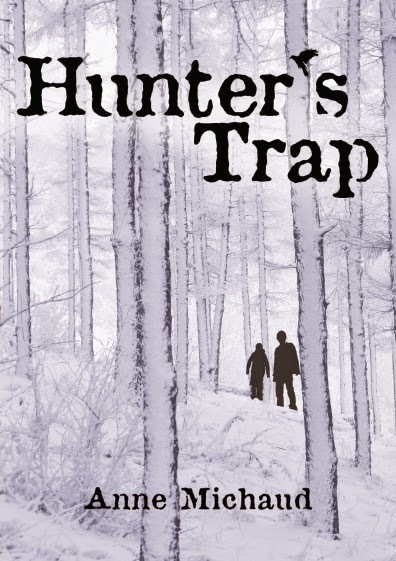 $15.99 pb/$3.99 e.
Hunter’s Trap, written by Ann Michaud and published by Sad Ghost Press, is a blood-chilling paranormal thriller unveiling secret dangers and ghostly inhabitants hidden in a snowy wood. Brothers Dayton and Jeremy, aged 17 and 12, investigate what happened to their father, who went out few days earlier for a hunting trip with his friends and never come back, the group of men seeming to have vanished into thin air. Michaud moves smoothly between genres, convincingly mixing elements that belongs to adventure, thriller, and ghost stories, sewing them together with impeccable prose. Unlike other thrillers or mystery stories, where the plot simply leads to the single, final twist or unsuspected truth, Hunter’s Trap offers a more complex and interesting approach. Michaud’s story, in fact, is built as a well-sructured series of subsequent complications and resolutions. Every new element—such as the arrival of another character or the discovery of a new clue—is ambiguous enough that the protagonists (and the reader with them) cannot say if it is the much needed help they were hoping for, or a further obstacle that will make things that already seemed nearly impossible, even more difficult. The author introduces layers of complexity so egregiously that, not only it is difficult to assess the connotation of the new variables when they are added to the plot, but some of them never completely lose their ambivalence. In spite of their young age, the two protagonists are not depicted as victims in need of the help of an adult, external savior, but as persons able to face the difficult and tragic situations into which they have been thrown, using their limited resources and knowledge. Having been abandoned by their mother and raised by an absent father, they grew up independent and autonomous. Their father’s social and emotional ineptitude has made the countless tips about hunting and surviving in the mountains the only way he had to communicate with his two sons. But, of course, not even their peculiar family history could have made two city boys unrealistically skilled and fit to survive in extreme conditions. Like every kid (as well as every adult), Dayton and Jeremy show fear, ingenuity, and incompetence, and sometimes they take decisions just relying on something they have seen on TV. Hunter’s Trap plays with the old belief, particularly popular in Mediteranean cultures, that the dead can only speak the truth. Probably because they don’t have any more reasons to lie once their earthly life is over. In Michaud’s story, ghosts are as likely to lie, hide and manipulate as living people. And trusting or not trusting them is a risk that the characters have to take. Also, changing status from “alive” to “no longer alive” doesn’t suddenly turn people in pleasant and peaceful companions. They re-enact the same (sometimes infuriating) behavioral patterns they showed in life. As in a gruesome fairy tale, the two little brothers get lost in the woods, and have to survive all the horrors they meet there, relying only on their own resources. And maybe a magic helper towards the end. The familiarity of all the characters with ambushing, killing, skinning, and cutting living creatures echoes again an—uncensored—folk tale. The author uses (without abusing) the blood and gore that accompanies hunting practices to feed the feeling of uneasiness and constant menace that pervades the whole story. The accuracy with which physical sensations such as pain, cold, weakness or illness are described is one of the ingredients that make the reading a very immersive experience. A reader not used to this kind of realism (or is maybe a little squeamish) may find the narration even slightly too immersive, in a disturbing and unsettling way. But isn’t this sort of reaction what horror stories are supposed to provoke? What I appreciated the most in this story was how traditional ghosts get mixed with the literary tradition of ghosts as projections of our deepest fears and desires. The portrait of Dayton, the elder brother and main protagonist, is really impressive in this respect. What if the father that you resented was really gone forever? What if you could get rid of the little boy that you’re probably going to spend your youth looking after? What if you could just walk away? Hunter’s Trap is a solid story with a very good plot, enjoyable beyond the preferences of genre. The author builds consistently a logic for her narrative world and is faithful to it until the end of the story. No unexpected easy tricks to make the reader jump on their seats: everything is prepared; (almost) everything could have been foreseen, if the reader—and the characters—had paid attention to the right details. Metaphorical ghosts and literal ones meet, overlap and fight each other in a story that takes your sleep away.